Metrolink in a Tail Spin: Is there a way out? Napoleon used to say that he liked his generals to be lucky. Presumably he would not have employed the first CEOs of Metrolink, who suffered considerably from ill fortune, particularly the Glendale accident. But bad luck is only one small part of the picture that has brought about the near collapse of Metrolink. After 23 years in being, consider that: Metrolink’s daily patronage is a little over 40,000 trips, or 20,000 customers. The annual operating subsidy is about $6,000 per customer, soon to be increased by another $1,000 (see below), in a population base of about 15 million people. Metrolink’s locomotive fleet has a high failure rate, and is being prematurely replaced with over $300 million of new locomotives, paid for by 1A High Speed Rail funds (!) and SCAQMD funds, the so-called Carl Moyer program. Metrolink’s peak hour oriented service pattern, with most locomotives enjoying a weekend off, allows for plenty of time for them to be properly maintained yet by their own admission key service and rebuild intervals have been ignored. There are still severe operating constraints, limitations to capacity caused by lack of investment to remove bottlenecks. Operationally, small delays can expand to major disruption as trains wait for meets on single track sections. Key markets, such as between northern Los Angeles County and Orange County, cannot be addressed because of the time taken to reverse at LAUS. Since the February Oxnard collision with a stray truck at a grade crossing there has been a cone of silence over the Rotem Cab Cars. At the SCRRA Board meeting of Friday 25th September 2015 the Board voted, with minimal public discussion, to authorize a lease of 40 freight locomotives for a year at a total net cost of $M19.125, or nearly $1,000 per customer. (Just before going to press this amount was increased to over $23M, but was referred back to the member agencies for their approval. They have to find the money.) These locomotives are to be placed on the train ahead of the cab car so that each train will have a Metrolink locomotive with only the HEP operative, the passenger cars including the cab car, and the freight locomotive providing the motive power. Such deliberations as there were, including any discussion as to where this extra money is to come from, was held in closed session under the rubric “anticipated litigation”. We await the NTSB decision on the results of the Oxnard accident, but has SCRRA been forewarned that the cab cars may be found to be inadequate protection for the engineer and passengers? Another theory is that this is a pretext for bringing in locomotives to make the trains more reliable as Metrolink’s own fleet is at a crisis point. We await the NTSB report about Oxnard with interest. We also await the “anticipated litigation”. Who might sue whom? In the meanwhile operating people familiar with the situation are concerned about the additional difficulties these added locomotives might cause. In some instances, e.g. Lancaster, overnight train storage is so constrained that there is insufficient room to add a locomotive without reducing the number of cars, or storing one train elsewhere. This might require a deadhead move from Los Angeles, shortening trains, or the reduction of service. Furthermore, with two locomotives on each train, both requiring fuel and service, operations at the maintenance facilities become more complex and time consuming, with the likelihood of delays. There is also the issue of whether these freight locomotives, normally having a lower maximum speed, will be able to make passenger schedules. To add insult to injury the Positive Train Control mandate has proven to be costly and technically complex to meet. I sometimes wonder if the politicians were told that the process would be no more than installing a “Garmin” in every cab, but clearly this is not the case. The area of the greatest long term concern is the turnaround time at terminals, especially LAUS. I have been told that 25 minutes is the minimum required to reverse a train, and indeed Amtrak now schedules 30 minute dwell time at LAUS for through Surfliner trains. The San Bernardino service seems to be the first to reflect this new reality. Billed as a “service enhancement” the number of peak hour morning trains is reduced from roughly 20 minute intervals to 30 minutes between L.A. bound trains. The eastbound afternoon departures are similarly reduced, although there is at least a clockface rationale to the new offering. And when oh when will we get rid of this nonsense of trains that “may leave up to 5 minutes ahead of schedule”? As far as I know this absurdity is unique to Metrolink. Anyone know otherwise? I’m hoping that the technical experts responsible for PTC will come up with a fix for this turnaround issue. With a captive fleet operating over limited track miles one would think that most of the data can be stored on board and all that would be required would be for the engineer to select a train number. Otherwise the possibility of adding service at LAUS must be almost zero until the run-through tracks are complete. In the meanwhile punctuality, whether caused by PTC problems, locomotive failures or other issues, has deteriorated. Today (10/2/15) I see 20, 30 and 45 minute delays on the Antelope Valley line. How long will the remaining customers stick with the service? Where do we go from here? We have to accept that Metrolink was built and implemented on the cheap. From the first day the system suffered from capacity constraints and bottlenecks that were an unfortunate fact of life in 1994, but by 2015 should have been fixed. 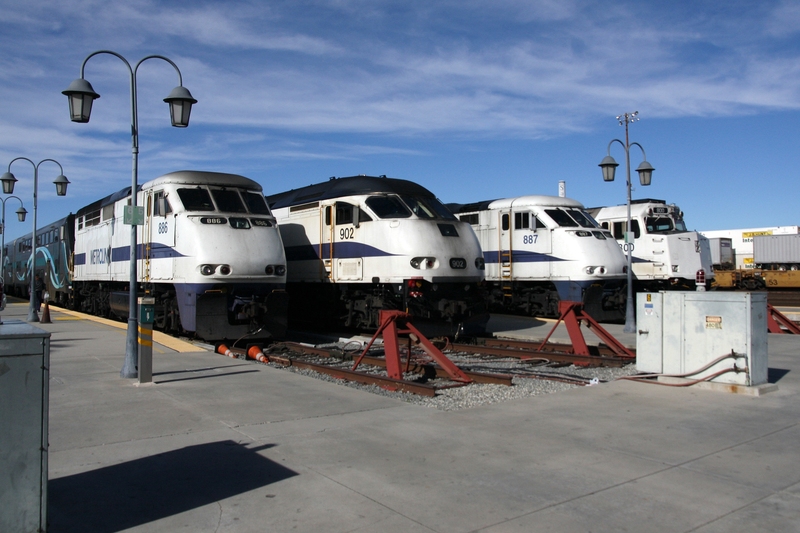 These include the LAUS run through tracks, double track on the Ventura and Antelope Valley lines in the San Fernando Valley, the I-10 single track through Alhambra, and the BNSF Transcon from Redondo Junction to Fullerton and beyond. Instead of making incremental investments over time to permit more reliable and frequent service the counties, Los Angeles County in particular wasted two decades before Metro CEO Art Leahy initiated a program of investment. We are two to three years away from reaping the benefits from those expenditures. Similarly we are at least two years from delivery of a significant number of the new EMD locomotives, and let’s hope that these units do not suffer from any reliability problems common with brand new equipment. So how should Metrolink proceed during this 2 to 3 year period with the assets that are available? One of the alternatives suggested by the staff report on the proposed BNSF locomotive lease was to decline to increase the operating budget and not go ahead with the lease. Staff stated that this would result in a major reduction in trains run, up to 50%. As I commented to the Board, this alternative should be seriously considered. Given the time taken to take delivery, prepare and deploy the BNSF locomotives, and given the ongoing issues with PTC, it may well be the most prudent action to curtail the current service to a level which can be reliably operated. With a Metrolink locomotive on each end of the train, additional cars could be added to the trains that do run, so that at least the number of seats available is not reduced by 50%. Furthermore the train sets that are available could work trains throughout the day, providing more travel opportunities. Let’s take this a step further. What if service were abandoned completely on some lines with the remaining train sets deployed to all day service on a core system? This would most likely consist of the Antelope Valley, San Bernardino and IE-OC trains. A sensible bargain could be struck with the LOSSAN Board to contract for space on a reconfigured Surfliner service to provide basic commuter schedules on the Ventura and Orange County lines. Perhaps also NCTD could be induced to extend service from Oceanside to Fullerton. This may seem like radical surgery. Indeed it is. Would the patient survive? There is a risk that Metrolink may lose the political support that it has if the daily passenger count goes down to 25,000 or less. On the other hand there would be considerable operating savings which should be devoted to locomotive maintenance and PTC installation and problem solving, as well as the ticket machines and revenue collection. By 2020 Metrolink will have a new fleet of locomotives, double track in the critical areas of the San Fernando Valley, LAUS run through tracks and other track improvements around the system, and PTC operating smoothly. That will be the time to relaunch the service, preferably with a new brand, to consist of all day, seven days a week through services between the Counties passing through Union Station, and providing cross platform transfers. By 2020 the local transit operators will have had time to plan connecting feeder buses and to integrate fare collection systems. Can the SCRRA Board rise to the occasion and use this difficult period to take a bold step for the future? In 1994, after the Northridge earthquake, Metrolink seized the opportunity to prove that rail can be part of the solution to our mobility needs. Rather than band aid the present service and essentially continue the poor performance and mediocrity, let’s hope that there are those on the Board with the vision to turn Metrolink into true REGIONAL RAIL.